Personally for me this is very exciting news – for 3 Million Years this could also be newsworthy, so I’m posting it here! Both Doctor Who and Star Trek are available digitally – So you can assume that this will be too. I will find out…. Doctor Who has never engaged in any such officially sanctioned crossover outside of the Doctor Who universe before. The closest was Dimensions In Time, a much derided charity telethon show which featured characters from the BBC soap opera Eastenders. Star Trek has also seen comic book crossovers with X-Men and the Legion Of Superheroes. But this is the first time that two major competing sci-fi franchises have been allowed to merge in any way before. Of course this kind of meeting has been the subject of fan fiction thousands of times. But thereâ€™s a very special something when it becomes official. IDW is attending the Gallifrey One convention in a weekâ€™s time. Iâ€™d expect this to be announced there. As to the detailsâ€¦ CyBorgmen? The Klingoon? The Time Lord Continuum? Dorian of the Ferenghi? 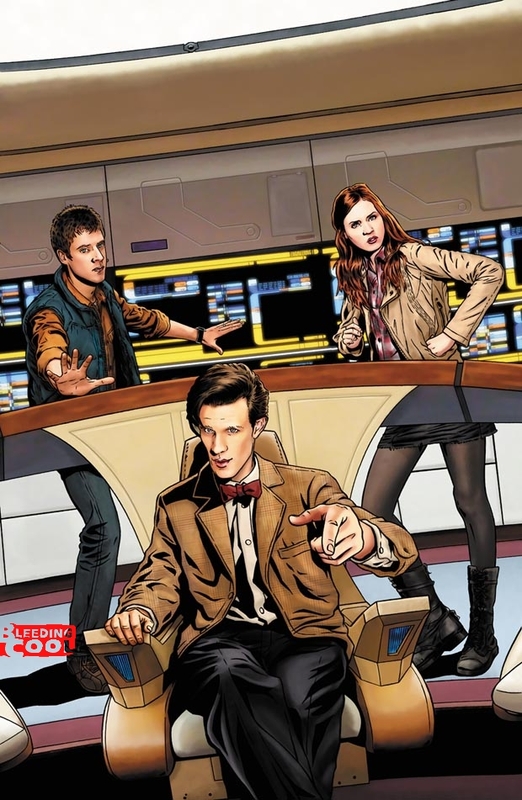 via SCOOP: Doctor Who/Star Trek â€“ The Official Crossover | Bleeding Cool Comic Book, Movies and TV News and Rumors.